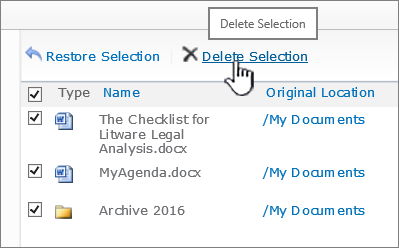 When you delete an item from a SharePoint document library or list, it isn’t immediately removed from SharePoint. Deleted items go into the site Recycle Bin for a period of time. During that time, you can restore the items you deleted to their original location, or remove them to free up storage space. Important: The SharePoint Recycle Bin is different from the Recycle Bin in Windows. To recover local files deleted from your desktop or apps, use the Windows Recycle Bin first. To put your Windows Recycle Bin your desktop, see Show or hide the Recycle Bin. Note: If you're looking for the recycle bin for OneDrive, go to your OneDrive site and select Recycle bin in the left pane. 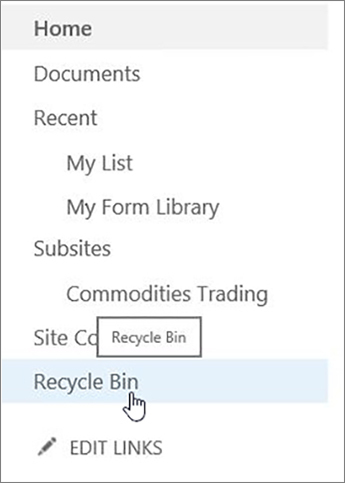 For info about restoring items in the site Recycle Bin, see Restore items in the Recycle Bin of a SharePoint site. Updated January, 2018, thanks to customer feedback. Click Recycle Bin in the Quick Launch bar on the left of the screen. Click Settings , and then click Site Content. The Recycle bin is in the top right portion of the Site Content page. On the Recycle Bin page, click the box to the right of the items or files you want to delete or restore. Click Delete to delete the selected files. Note: If you don’t see the item you’re looking for, it might have already been deleted and already moved to the site collection Recycle Bin. Or it might have exceeded the holding time limit (93 days) and already been permanently deleted. On the Recycle Bin page, click Empty recycle bin to delete all items. If Empty recycle bin isn't visible, make sure you unselect all items in the recycle bin. Note: The Recycle Bin shows only the items that you have deleted. You cannot view items that were deleted by other users unless you are a site collection administrator. If you do not see the Recycle Bin on your site, it could have been disabled by the server administrator. If you're an administrator, see Configure Recycle Bin Settings on TechNet. 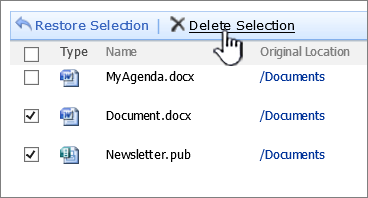 Click Delete Selection to delete the selected files. Note: If you don’t see the item you’re looking for, it might have already been deleted and already moved to the site collection Recycle Bin. Or it might have exceeded the holding time limit and already been permanently deleted. Click Recycle Bin on the Quick Launch bar (you may need to scroll down). If the Recycle Bin doesn't show on the Quick Launch bar, click All Site Content, and scroll to the bottom. The Recycle Bin shows only the items that you have deleted. You cannot view items that were deleted by other users unless you are a site collection administrator. If you don’t see a Recycle Bin The Recycle Bin might have been disabled. Talk with your farm or server administrator. If you're an administrator, see Configure Recycle Bin Settings on TechNet. Select the check box next to the items or files. If the Recycle Bin doesn't show on the Quick Launch bar, click All Site Content, and scroll to the bottom and click Recycle Bin. On the Recycle Bin page, click the box to the left of Type at the top of the first column, and then click Delete Selection to delete all items. Can I get back items I delete from the SharePoint site recycle bin? 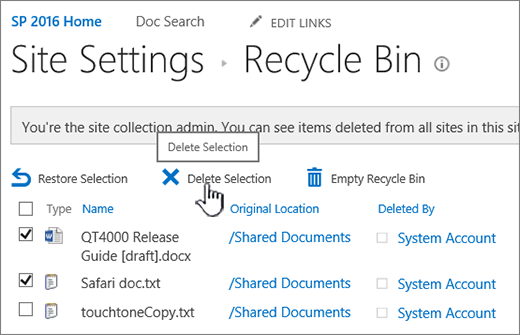 When you delete an item from a site recycle bin it automatically goes into the Second-Stage or Site Collection Recycle Bin where it remains for a set period until it’s permanently removed from SharePoint. 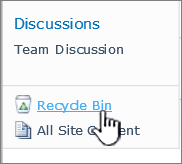 If you’re a site collection admin, you can restore items from the site collection Recycle Bin. For info, see Restore deleted items from the site collection recycle bin.